Please call for has the appointment. Photo courtesy of Simon Penny. Found at bee/honey museum in Taiwan. Happiness is a warm prompt. If I am supposed to arbitrarily not enter, doesn’t that mean I may also arbitrarily enter? Or am I being too coordinated? I thanak you in advance for your distinguished response and wish you a warm prompt. I’m not sure how thanaks will affect my coordination. I’ve never had them before. Won’t you take me to, Fong Cai Town! This place is the bee’s knees. 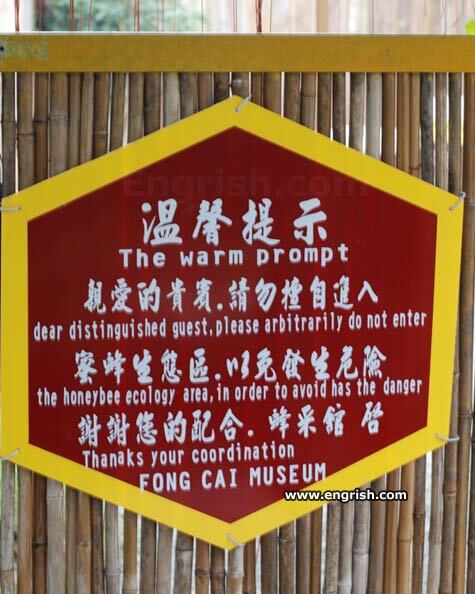 So if I’m feeling deliberate, would it be OK to enter the honey bee ecology area? By the way, thanaks for noticing my coordination. Yours is pretty good too, I am sure. Do you come here often? In plain Engrish; enter at your own stupid risk! @Frank Burns: (“Fong Cai Town”) Good one! If you arbitrarily enter, the honeybees will arbitrarily sting you too. Also, prease don’t bee confused by sign this. In case of fire arbitrarily run like f—. That’s where those alien-virus-infested bees from the X-Files ended up!